From Iron Springs Road heading out of Prescott we turned on Skyline Drive. The road name accurately reflects panoramic east and west views while traveling south atop a ridge. We drove through the Highland Pines development with a detour down a side road where Skyline Drive ends. A dozen or so homes are located off this steep, narrow, twisting road, often with even steeper driveways. It must be interesting navigating in or out in the winter. We parked at the end of the paved Skyline Drive for our walk. Three homes were located near the beginning of the rugged, rocky dirt road. We walked about a mile, encountering a couple of quads and observing various wildflowers including Arizona thistle and cardinalflower, before finding a y junction with a sign that identified the West Spruce Trail. Two couples who were picnicking nearby with a view of Granite Mountain and Skull Valley had driven over the eroded road in a 4-wheel truck. We continued walking until the next intersection where we were near West Spruce Mountain which has douglas fir rather than spruce. I have since discovered that West Spruce Mountain has an elevation of 7,160 feet. We decided to explore the roadway opposite the one marked 47B. At the next junction we circled back on C120 rather than following 47. The views on our return to our car featured Granite Mountain on one side of the road and Thumb Butte and the faraway San Francisco Peaks on the other. 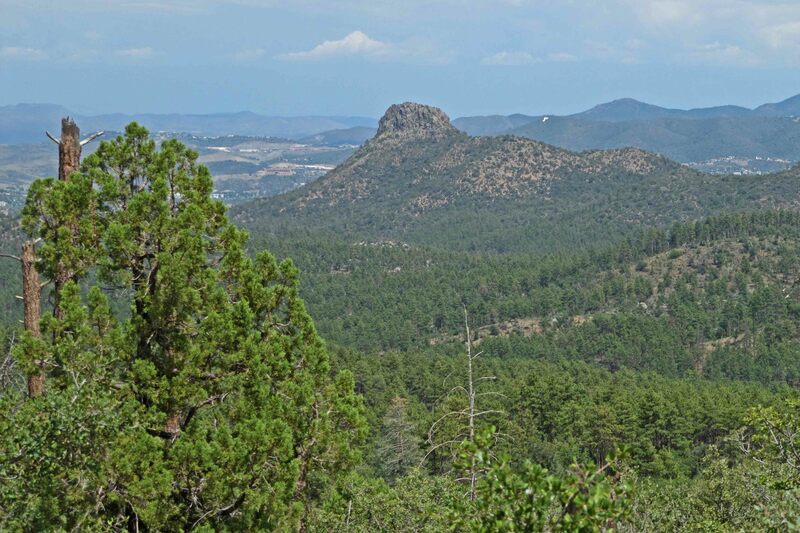 It is possible to experience rugged forestland near Prescott, Arizona. This past Saturday Mike Vax and his quartet played at the Highlands Center for Natural History with invited guest Dennis Rowland. Rowland, originally from Detroit, now makes his home in Phoenix. For seven years he was a vocalist with the Count Basie Band. We heard him in February when he was featured on the main stage of the Arizona Centennial Best Fest. His rich, deep voice resonates with his spontaneity while performing with different groups. His drive to Prescott needed to be rerouted after encountering a closed I17. Consequently, he drove through Wickenburg and arrived after the scheduled 7 p.m. starting time. In his absence the Mike Vax Quintet played a song from their repertoire and Mike Vax answered questions about jazz from the audience of about 200. He made clear that he considers the term “smooth jazz” a misnomer. He emphasized how each jazz performer creates their solo from the material. The musicians playing with and for Dennis Rowland included Mike Vax, trumpet; Jack Petersen, keyboard and guitar; Tony Vacca, saxophone and flute; and Ted Sistrunk, bass. We arrived an hour before the scheduled concert start time and sat in the front row. Like the concert we attended last year, monsoon rain drove those without cover to leave early. We enjoyed a fine concert with outstanding performances by Dennis Rowland and the Mike Vax Quintet. “Beyond History’s Records” sets the scene of what New Mexico was before Europeans arrived. The Far Northern Frontier” examines the conflicts that arose among Native peoples and the Spanish. Linking Nations” documents the opening of the Santa Fe Trail and the traders, mountain men, and settlers who found their way to New Mexico. “Becoming the Southwest” details how conflicts over land and water bred a culture of lawlessness and how the introduction of the railroad drew machinery, workers, tourists, and artists. It was interesting to examine early maps which often included what is now Arizona and to learn about connections between the two states. A special exhibit on the second floor, “The Saint John’s Bible and Contemplative Landscape,” was an unexpected surprise. The Benedictine monks at St. John’s Abbey and University in Collegeville, Minnesota commissioned a contemporary handwritten Bible with calligraphy and illuminations on vellum. Donald Jackson developed a concept piece while on retreat in the 1990s at Ghost Ranch. He organized a team of artists and calligraphers at a Scriptorium in Wales to complete this project. This special exhibit displayed 44 of the 1,150 pages from two of the Bible’s seven volumes – “Wisdom” and “Prophets.” It was a treat to be able to view samples of this monumental work. The Cathedral Basilica of St. Francis of Assisi, built in 1869, is another important Santa Fe landmark. The Cathedral’s sharp French Romaneque lines contrast with the rounded contours of other downtown buildings such as La Fonda of Santa Fe where we stayed. Archbishop J. B. Lamy, who inspired Willa Cather’s novel Death Comes for the Archbishop, is buried beneath the main altar. Outside the Cathedral, in addition to a statue of Archbishop J. B. Lamy, there are statues of Blessed Kateri Tekakwitha, St. Francis of Assisi, and St. Francis of Assisi Dancing on Water. On Saturday we enjoyed lunch at the Bishop’s Lodge with local residents and friends from Ohio, Jim and Rose. Interestingly, New Mexico Governor Susana Martinez and her husband were also dining there. Bishop’s Lodge was a retreat of Archbishop Jean Baptiste Lamy. He was born, educated, and ordained in France. For a decade starting in 1839 he served as a missionary in Ohio. 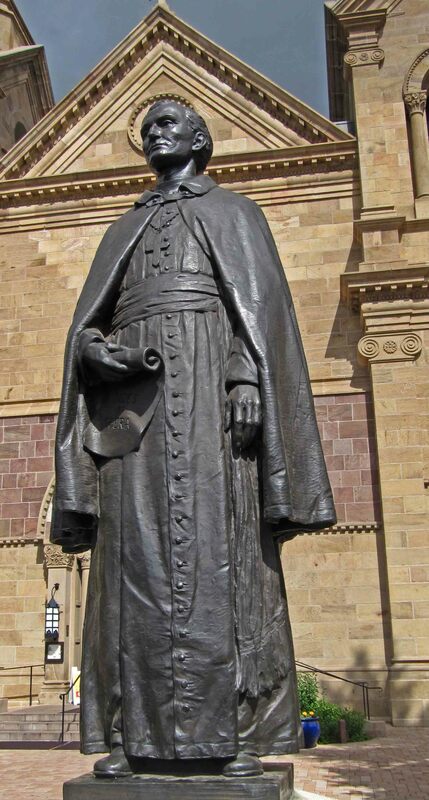 In 1853, the Diocese of Santa Fe was officially established with Lamy as its bishop. They busy prelate, faced with problems of an extensive jurisdiction frequently beset by controversy, founded his retreat along the Little Tesuque stream, a few miles north of Santa Fe. We visited the remains of the original retreat, a bedroom and sitting room separated by a hall which led to a small chapel. We also visited the Georgia O’Keefe Museum. It is dedicated to perpetuating the artistic legacy of Georgia O’Keefe and to the study and interpretation of American Modernism (189-present). O’Keefe, born near Sun Prarie, Wisconsin, was a member of the Stieglitz Circle of avante-garde artists in New York City in the 1910s. From her first prolonged stay in New Mexico in 1929, she drew inspiration for her art to the end of her life in 1986. In 1934 she discovered Ghost Ranch, an extraordinarily colorful 25,000 acres of painted desert, about 60 miles north of Santa Fe. She bought a house there in 1940. In 1945 she purchased and with her friend, Maria Chabot, restored a 5,000 square foot Spanish Colonial-era compound in Abiquiu. Our drive from Taos to Santa Fe passed by Ghost Ranch and the O’Keefe home and studio in Abiquiu. Our lunch stop near Abiquiu Lake put us in the midst of the landscape that so inspired Georgia O’Keefe. At the Museum we listened to a docent who introduced the current special exhibit, “Georgia O’Keefe: Nature and Image.” We only scratched the surface of all that Santa Fe has to offer. In 1540, Spanish conquistador Francisco de Coronado led an expedition into what is now New Mexico looking for gold and silver reaching Taos on August 29. Spanish colonization of the region started after 1598, Taos in 1615. The name “Taos” is an adaptation of the Tewa Indian word “Towih,” meaning “red willows.” It became the Town of Taos on May 1, 1796. Antonio Jose Martinez (1793-1867) lived through the Spanish (1793-1820), Mexican (1821-1846), and American periods of New Mexican history. He was an educator who established a primary school and later a college preparation course, a publisher who printed books for his school and a regional newspaper, a political leader, and a parish priest (1826-1858). 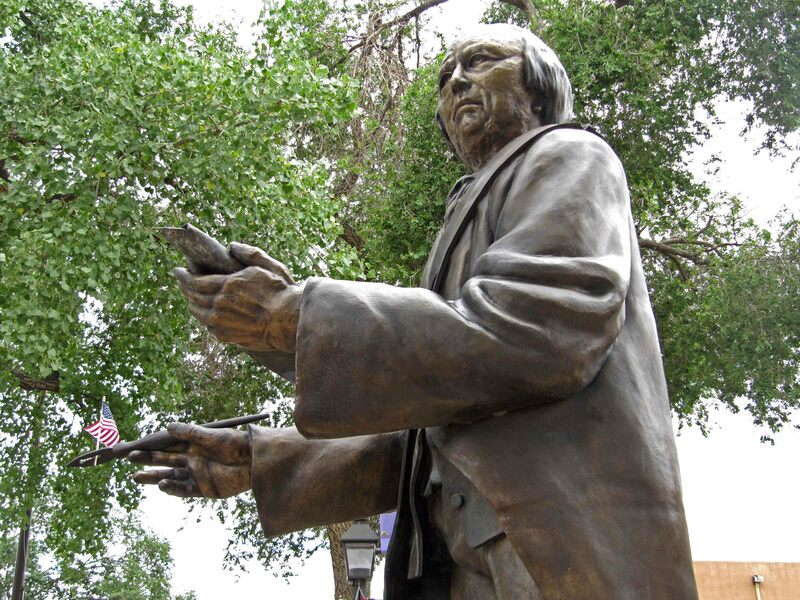 He is recognized with a statue by Huberto Maestas in the Taos Plaza where evenings concerts are held Thursday evenings. The 531st Air Force Band of the Texas Air National Guard played during our visit. Some members of other bands such as Illinois joined in for the two hour concert. We enjoyed an inspiring professional performance. Earlier in the day we took a trolley tour that introduced us to Taos and included a stop at the Taos Pueblo previously reported on. We learned that the Hacienda de los Martinez Museum was originally a major trade center that brought together diverse people. Another stop was at the San Francisco de Asis Church famous from an Ansel Adams photograph of the smooth curves at the rear of the church. The lighting did not allow me to mimic his masterful work. In 1898, two young artists, Ernest Blumenshein and Bert Phillips, were touring the West and decided to settle in Taos. Later, with four other artists they formed the Society of Artists which has evolved to this mecca for artists. Art is everywhere in Taos. George Chacon’s El Santero mural memorializes the creators of sacred artifacts. A bed and breakfast had a colorful garage door along with a colorful front door. I was surprised to learn that English author D. H. Lawrence visited and died in Taos. Conservationist Aldo Leopold worked in nearby Carson National Forest. We stayed at the distinctive El Monte Sagrado which is located only a half mile from the Taos Plaza. We enjoyed a great meal in their restaurant. We had tortilla soup and nachos at the La Fonda of Taos restaurant and a late night snack of a taco salad and chili releno at Doc Martin’s Restaurant. Doc Martin, who arrived in the 1890s, was the first physician. The coyote fence protecting many homes and ranches was new to me. We left town on Highway 64 so that we could see the Rio Grande Gorge Bridge. This suspension bridge crosses the deep gorge of the Rio Grande about seven miles west of Taos. 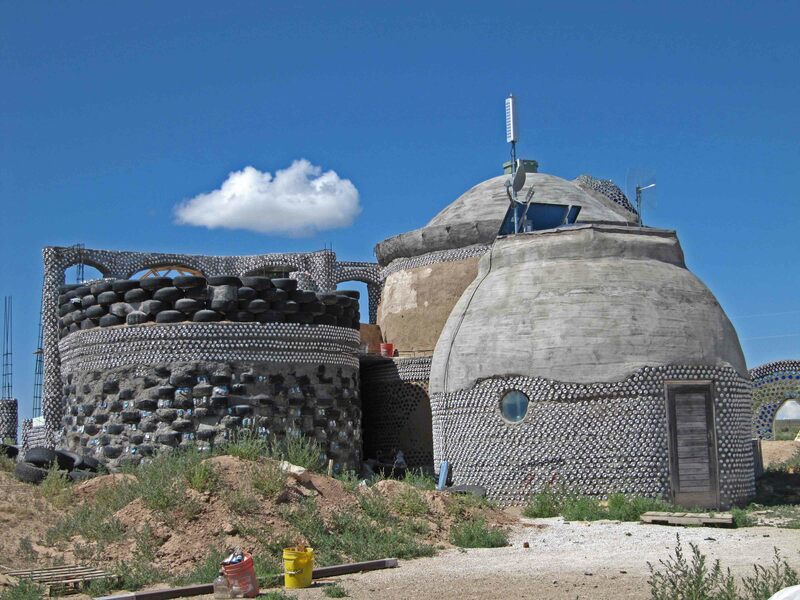 Earthship Biotecture, a few miles further, has about 60 homes built into the earth and/or using natural and recycled materials such as tires and bottles. Many homes are quite whimsical in their appearance. These homes use solar/thermal heating and cooling, solar and wind electric power, water harvesting, and contained sewage treatment. One home, the “Euro” Earthship, was for sale, a mere $369,000 for three bedrooms and two bathrooms. Taos is one of the most interesting cities in the United States. 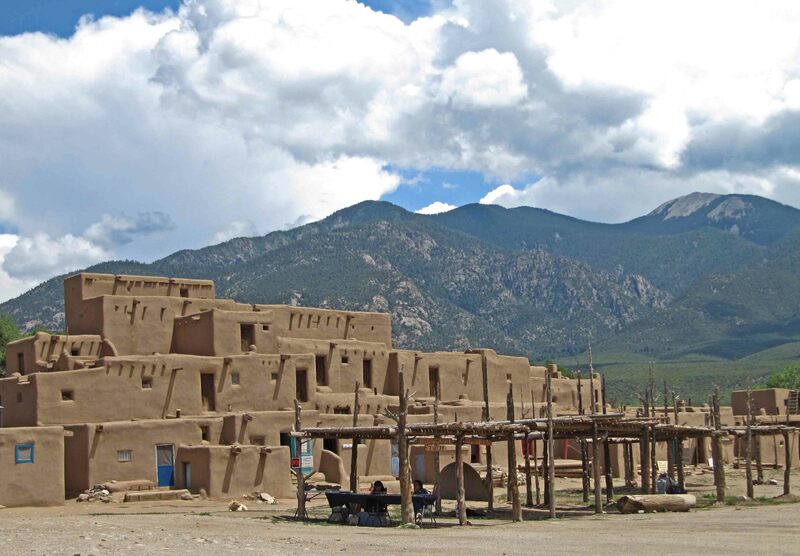 In 1992, Taos Pueblo was recognized by UNESCO as the first Living World Heritage site. It is an outstanding example of a traditional human settlement which is representative of a culture and which has become vulnerable under the impact of irreversible change. Taos Pueblo is considered the oldest continuously inhabited community in the United States. Buildings are individual homes built side-by-side and in layers with common walls and no connecting doorways. Previously, the only entryway was by ladder through an opening in the rooftop which made it difficult for anyone unwanted to enter. Today, homes have doorways. Homes are built with adobe composed of earth, straw, and water which is mixed and poured into forms. After the bricks are sun-dried, they are stacked and bonded together with the adobe mixture. The roofs are supported by criss-crossing timbers. The exteriors are plastered annually with adobe. The Pueblo has no electricity and no running water. The Red Willow Creek is named after the willows that grow along the banks. The river divides the community into the North House, Hlaaume, and South House, Hlaukkwima. The Sangre de Cristo mountains can be seen in the distance beyond the North House. The Saint Jerome Church, built in 1850, is a registered National Historic Landmark. Native rituals are immensely important, but 75% of the population shares in some Catholic practices. Kivas, although off-limits to visitors, were evident. The cemetery is where the original San Geronimo Church, built around 1619, was located. U. S. troops destroyed it in 1847 in retaliation of an uprising that killed the Territorial Governor, Charles Bent. Horno is a Spanish word for the outdoor adobe oven still used. We tasted some frybread which was baked in the South House. We purchased two CDs with Native music. Back in Taos, we saw a family from the Taos Pueblo perform several social dances accompanied by a drummer/singer. The music on the CDs and our pictures will help to remember this interesting community. From Albuquerque we connected with the Jemez Mountain National Scenic Byway at San Ysidro. The striking Red Rocks caused us to pause and consider hiking the Red Rocks Trail. 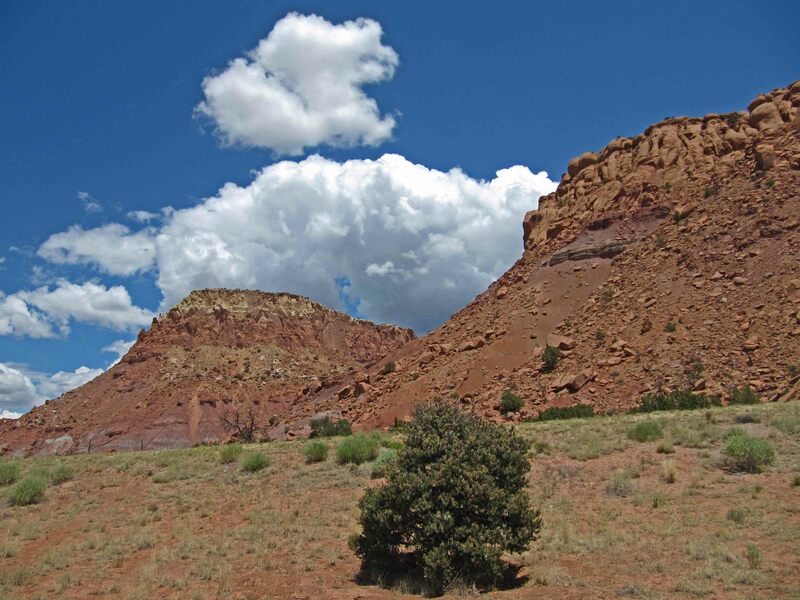 However, in order to enter this area requires a native guide of the Jemez people. We made another stop at the River’s Bend National Recreation Area fishing access on the Lower Jemez River. The sound of the rushing water and the dramatic cliff was worth a stop. Soda Dam was another eye catching natural site along this road. 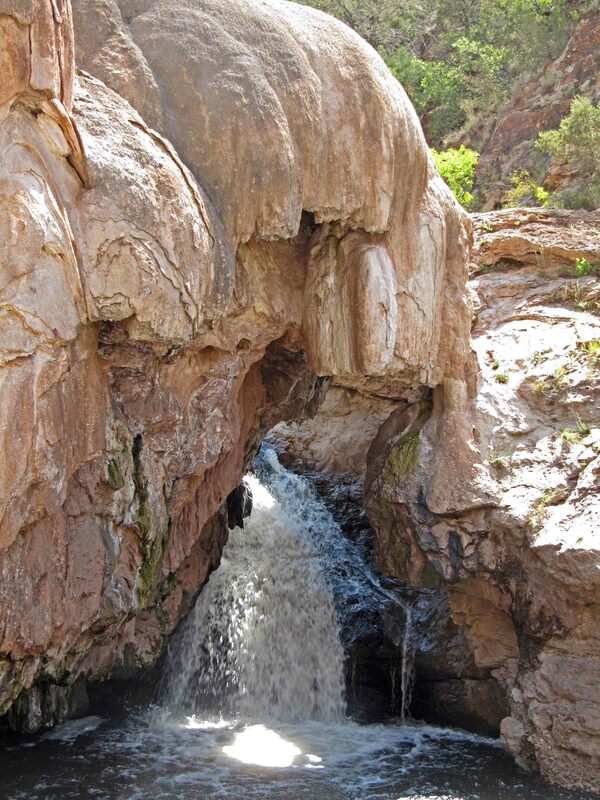 A gushing waterfall flows over the calcium carbonate mineral deposits. Several signs along the way warned of “congested area.” We chuckled until we approached Jemez Springs where the road was indeed congested. People lined the streets and traffic stopped as preparations for a Fourth of July parade. Because of last year’s forest fire and flash flood, we could not drive into Bandelier National Monument. Instead, we needed to proceed to White Rock and return via a shuttle. Bandelier National Monument was the scene of a naturalization ceremony for new U. S. citizens. After viewing a 14-minute video about the area, we walked the Main Loop Trail through the Frijoles Canyon. Tyuonyi was the setting for a pueblo with a large kiva. Then, we ascended to view close-up the cliff dwellings, including Long House. The Las Conchas Fire from June 26 to August 1, 2011 burned 154,349 acres. 62% of Bandelier, some 33,750 acres, burned during this fire. Then, on August 21, 2011 a flash flood in Frijoles Creek caused further devastation. 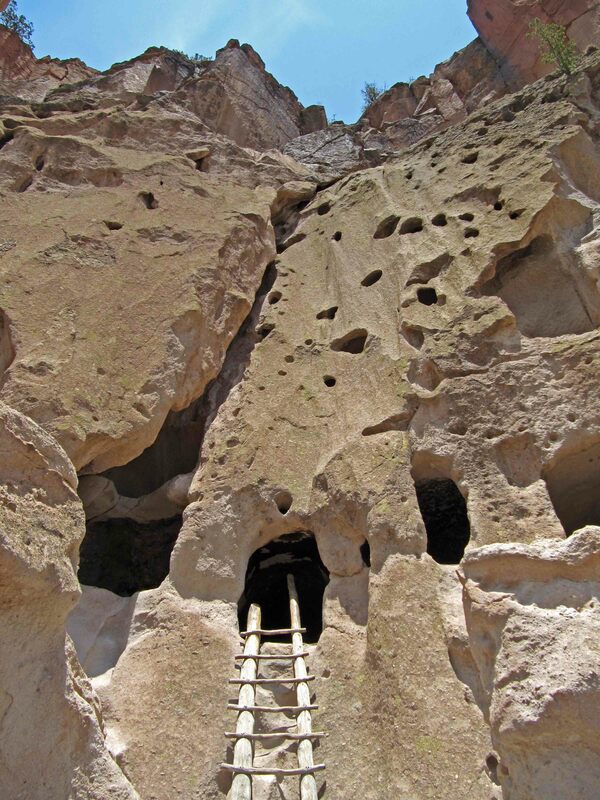 Bandelier is another interesting National Monument worth saving and protecting.